Google’s Android Market is now home to a couple not-so convincing Siri clones, both of which use Apple’s official Siri icon and one that attempts to mimic the UI. Developer Viewide is even marketing one of the applications called “Speerit” as “REAL Siri for Android”. Speerit (pictured above), is for now only available in Korean, but the developers plan to support English in a future update. As Electronista pointed out: “Differing results on the weather widget suggest it’s not actually asking Apple’s servers.” The app is available on the Android Market for free. Another app, called Siri for Android, as picked up by The Next Web, made a point of clarifying it is simply a Siri icon that acts as a shortcut to Google’s Voice Actions. 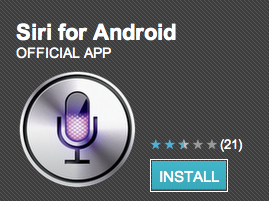 Although, like Speerit, it too boldly uses what appears to be Apple’s official Siri icon. Also, the app’s name, “Siri for Android,” beside the developer’s name, “Official App,” could give users who don’t know any better the impression it is some type of official Siri port. The app is also available for free in the Android Market. No word on whether Google or Apple plans to take action. Controversial or knockoff apps being removed from the Android Market and the App Store is not uncommon, but it is clearly a bigger concern for the Android Market’s easygoing review policies.